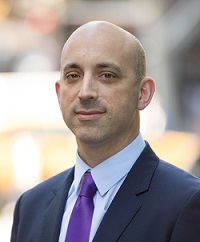 Since becoming CEO in July 2015, Jonathan Greenblatt has modernized ADL to re-focus the organization on its original mission: to fight the defamation of the Jewish people, and to secure justice and fair treatment for all. Under Greenblatt’s leadership, ADL has worked in new and expanded ways to combat and uncover anti-Semitism. Prior to joining ADL, Greenblatt served in the White House as Special Assistant to President Obama and Director of the Office of Social Innovation and Civic Participation. He came to that role after a long career as a serial social entrepreneur and corporate executive focused on creating economic value and social good. Please join us as Jonathan shares his experience in government and as an entrepreneur, and how these experiences shape his work at ADL. We recently witnessed the deadliest attack on American Jews. White supremacist propaganda on campuses has increased. Online hate and harassment is a real and growing threat. Jonathan will share with us how ADL continues to honor its mission while developing cutting-edge practices to tackle these newfound challenges. ADL is a leading anti-hate organization. It is the first call when acts of anti-Semitism occur and fights all forms of hate. A global leader in exposing extremism, delivering anti-bias education and fighting hate online, ADL’s goal is a world in which no group or individual suffers from bias, discrimination or hate. We are honored Jonathan Greenblatt will be our guest speaker at our upcoming KFN Advisory Board meeting on May 29th.